The Woodwork Career Alliance was launched with a small grant and a big idea: establish credentials for employees to document their skills, and to provide prospective employers a reliable way to evaluate new workers. It’s always been difficult to find skilled wood manufacturing workers – largely because it’s difficult for woodworkers to demonstrate what they know during the interview process. Resumes can tell but not show how good a prospective employee’s skills are. Woodworkers earn WCA skill patches as they gain proficiency on machines. Pictured are (top to bottom): Machine Specialist, Green, Blue, Red, Gold and Diamond patches. 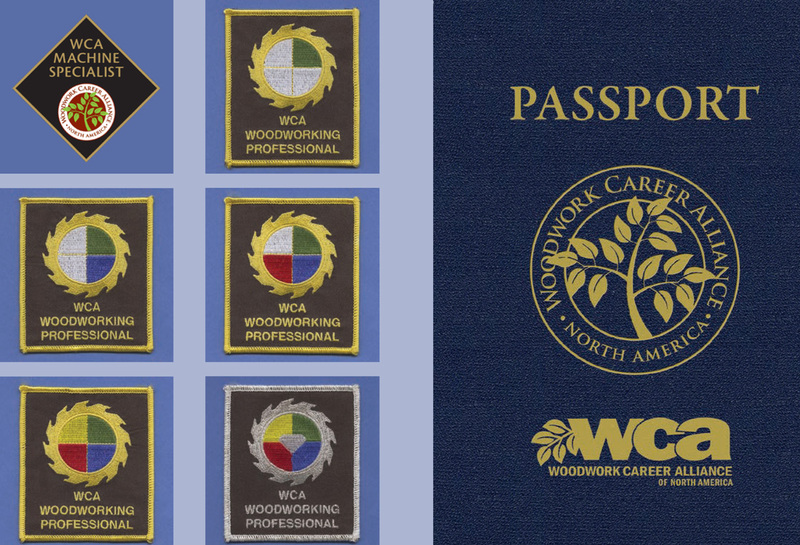 Right: WCA’s Woodwork Passport provides workers with a record of their skills. The Woodwork Career Alliance, based in Nellyford, Virginia, addresses that challenge by documenting professional worker skills. These are verified by certified Skill Evaluators, then recorded in a Woodwork Passport – both a physical booklet, and in a database – tracing individual paths of improving competency. The Woodwork Career Alliance credential system records both the duration of experience and competence using a range of machines and tools – as well as completion of projects. It starts with a Green Credential (six months experience), through Blue (one year), Red (two years), Golden (three years) and Diamond (four years). Worker capabilities on using dozens of machines and tool sets – 240 in total at this point – are tested against uniform standards for an objective assessment. A new WCA Machine Specialist Patch was created for workers in factory settings whose job focuses on one production technology. Certified Skill Evaluators now number 180. Since its launch, the WCA’s observable, and measurable, performance standards help feed workers into the industry pipeline, and is adaptable to new conditions within industry. WCA has issued more than 1,000 Passports to workers. And more than 125 high schools and post-secondary schools throughout North America are WCA EDUcation members – an affiliation for academic and technical training centers. All this started in 2007, when the Woodwork Career Alliance was formed with $92,000 from the USDA Forest Service and matched by the Architectural Woodwork Institute to develop the Wood Manufacturing Skill Standards, Evaluations and Credentials Project. AWI served as secretariat for the launch and continues to provide support, but the program is truly an industry-wide initiative. Fox Valley Technical College in Appleton, Wisconsin, is one of more than 100 Woodwork Career Alliance EDUcation members. Now the WCA is ratcheting up efforts to expand awareness and adoption among wood products manufacturers, and to give the Woodwork Passport credential significant weight in hiring. A good example of WCA’s potential impact is at Appalachian Engineered Flooring, in North Troy, Vermont, which opened in 2012. By the spring of 2014, Owner Jean Leduc and General Manager Jennifer Fraser saw that the company faced obstacles beyond normal startup challenges. Of 20 staffers, turnover was 1 to 3 people a month; production and financials also were unpredictable. In May 2014, the Northern Forest Center – a four-state (VT, NY, ME, NH) business development organization – introduced Appalachian Engineered Flooring to its Wood Products Innovation Center. Guided by Jeff Howe of Dovetail Partners, experts set them on the course to lean manufacturing. Once stabilized, AEF was ready to implement the Northern Forest Center’s Skilled Workforce Initiative for Wood Manufacturing with its partner, the Woodwork Career Alliance. WCA President Scott Nelson, and Greg Heuer, secretary, worked with Appalachian Engineered Flooring to developed new Skill Standards on the machines. WCA trained senior employees as in-house Skill Evaluators and the Skill Standards were used to create a new company training manual. All manufacturing employees began participating in the in-house training program in the spring of 2015, and have been enrolled in WCA’s Woodwork Passport program. By August, WCA performed an audit that certified each employee’s level of proficiency, and recorded in the employee’s Woodwork Passport. For Appalachian Engineered Flooring, the systematic training and credentialing of employees under the Woodwork Career Alliance enhances the company’s culture. And the Skill Standards help define “standard work,” an important concept in lean manufacturing. 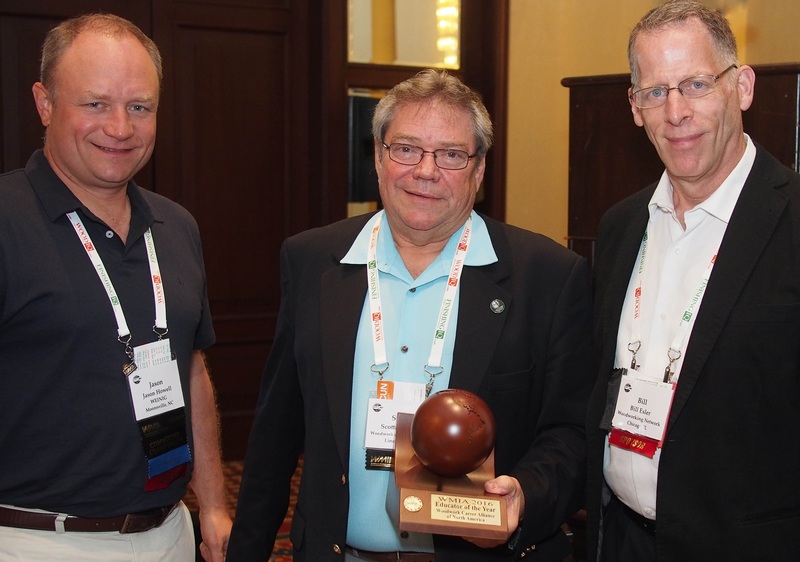 The WCA’s efforts in assisting with woodworking education were recognized recently by the Woodworking Machinery Industry Association, which awarded the organization the 2016 Wooden Globe Award for Educator of the Year. WMIA education chair Jason Howell, president of Michael Weinig, Inc. / Holz-Her U.S. Inc.; Scott Nelson, president of Woodwork Career Alliance; and Wooden Globe nominator Bill Esler, editorial director, Woodworking Network. Its efforts to address the critical need for skilled workers have earned the Woodwork Career Alliance the 2016 WMIA Wooden Globe Award for Educator of the Year. The WCA (WoodworkCareer.org) was recognized for its development of industry-recognized skill standards for workers. WCA President Scott Nelson accepted the award on behalf of the organization. Nelson, who took the helm of WCA after nearly three decades as CEO of Central Plains Millwork in Lincoln, Nebraska, has been a tireless advocate for the programs he oversees.